Posted on July 14, 2011, in Hot Off the Press and tagged book review, china miéville, science fiction. Bookmark the permalink. 4 Comments. So happy to find another Mieville fan! spot on. Mieville seems to pull that trick a lot, and along with not passing judgement on whether the change is good or not, he throws in characters who also have no idea how things will end after the story ends. I adored Embassytown. The Bas-Lag book it most felt like to me, was The Scar – a creepy thriller that’s not really about what it’s about. Cool review as usual. I still need to get through Kraken but I might have to bump this book up my TBR list too. Although I think it might have to wait until the winter. I tend to prefer heavier –in terms of subject matter as well as bulk– books when its cold. Might be the Russian in me. Or re-read Perdido Street Station and The Scar or get around to The City & the City… Argh, too many options. Maybe I need to have a China Mieville month. 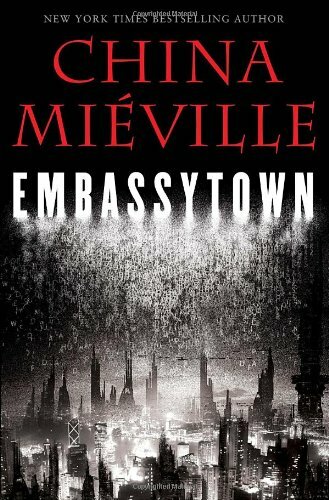 I like the idea of a China Miéville month! That would be amazing. But I think your brain would hurt by the end of it.